Congratulations! Having gone through months of pants muslin-fitting myself recently (the end, literally and figuratively, is finally coming into view), I appreciate even more what it took to accomplish what you did. I also spent time writing a post about my pants-fitting saga a few weeks ago and when the word count hit 2800 and I was not even close to concluding, I scrapped the damn thing and started over. I like your points about knowing your own proportions and not just your height and circumferences. I am looking forward to recounting my own pants saga in words and pictures, but I will bow to you in the .gif department! Your rear pun cracked me up, Paula! Honestly, I got so lucky with my block: it’s copied from a RTW pair of jeans from a long time ago (2009 I think?) that fit perfectly but had seen better days; that store changed the fit of their jeans in the years between that purchase and when I learned to sew, and I’m so glad I kept them even after one of the belt loops tore a hole in the back yoke. That said, I am bummed (Hah! More #buttpuns!) that I missed Nina’s pants class, as I’m sure she could have helped me refine things even further. Oh brava! I am just working on my third pair – with a zip fly front, no front pockets, jean style back pockets and a curved waist band. I am part way through drafting my own pants block and this was just the inspiration I needed to finish it. I do think from seeing this post however, that I need to pull in my rear inseam a little more to avoid the full PJ pant experience. Especially as I am making these in sage green/antique gold paisley b/c why not??!! Oooooo I cannot wait to see those, they sound much livelier than mine! 😉 The Landers have been a much bigger wardrobe staple than I expected them to be, that’s for sure. I have like, 3 more pairs planned, LOL. I just need to decide if I want button or zip fly for each one; somehow I feel like there’s a limit on how many exposed button fly pants you’re allowed to own, haha! Agreed. I also was looking at 3 or so other patterns and realised the lander is a good basis for simple hacks. So zipper fly was perfect next step! Looking good. I’d be happy with the fit on the wine pair, being in the camp that thinks you can over analyse every wrinkle. In a typical cotton twill there’s going to be some creasing and pulling in the crotch area in movement. If they’re comfortable and I don’t feel the need to tug at them or experience the webbed leg effect I call it a day. Hooray for Landers! I love all of yours and you’re seriously making me consider the cropped pants version for myself. 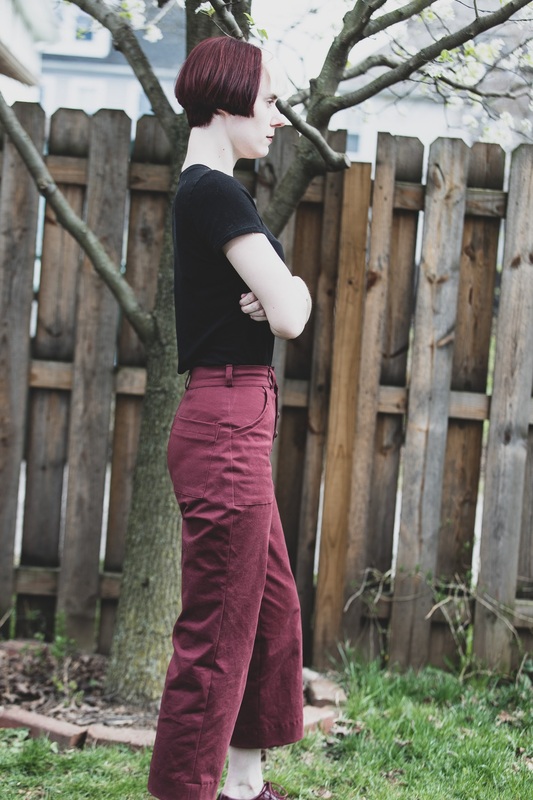 I’ve made one pair of the pants and 2 shorts and definitely want to make more! I have one of the shorts photographed, but am also being lazy about the second pair. 😉 Also, we’re style twins as I paired one of my Lander shorts with the same Peplum top! LOVE that combo! I’m glad you finally shared all of your Landers (yes, I have been stalking you, waiting for this post). I’m also intrigued by your nighttime photos… how’d you get them to come out so great? P.S. You ARE the .gif KWEEN! Hahaha I am not sure that hashtag belongs with my rear, but I’m gonna take it! (And my rightful kweenly crown of the Kingdom of .Gif, thankyouverymuch! 😉 ) AND HOORAY FOR STYLE TWINNING!!!! I love that little top, and need at least one more before summer ends! 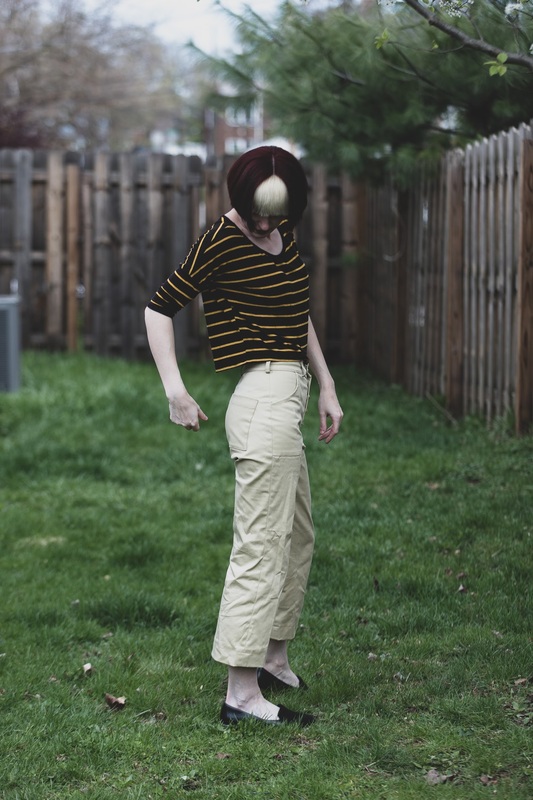 The cropped Landers are super useful, even when it’s cold; I did struggle with choosing footwear at first though. And those nighttime photos were done with 2 umbrella flash thingies (#notaphotographer). I’m actually going to go into a little more detail on that in my next post but it was half test, half blog photoshoot, LOL! SO fantastic! You are the queen of .gifs, and also of long-form posts! I love all the detail and pictures – and then the silly pictures at the end were the icing on the cake! Those are some great looking pants! I’m sure everyone thinks I’m extremely lazy when it comes to fitting pants because I don’t bother much with all those little fitting details that most sewists obsess over so much. If they’re comfortable and don’t look like I dragged them out of a dumpster I’m fine with them. A certain amount of wrinkling and creasing is just a sign that you’re alive and you move and sometimes sit. I rarely blog pants though. I always use stretch fabric for pants – stretch twill, stretch denim, or even cotton knit. LOL I don’t know, maybe vacuum-sealed will be the next big “look”?